For many students, essays are the most challenging part of the college or university experience. This is not surprising; many students who enter college directly from high school have not been prepared for university-level writing. Students who are returning to college after a stint in the workforce or military may not have written an academic assignment in years, which can be frightening. Even competent, confident writers can find an essay assignment overwhelming if a topic is challenging or if they are unfamiliar with the type of essay that has been assigned. So, we sat down with a group of writers (some of them being retired professors) and asked them to help us come up with the absolute best student guide on how to write an essay. 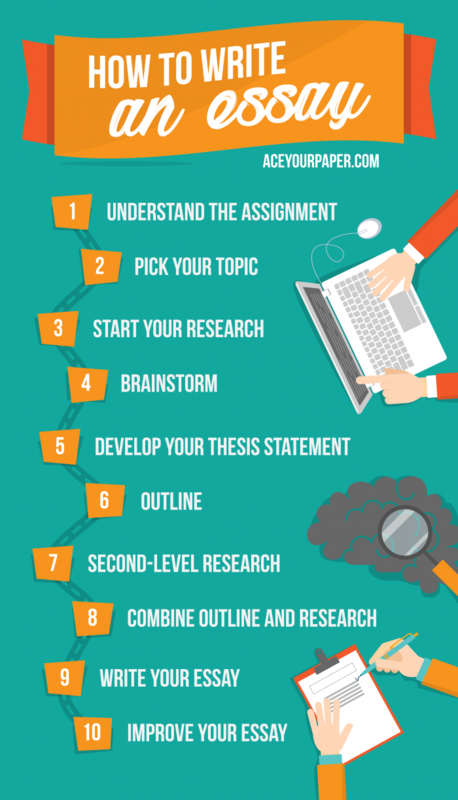 With their help we came up with this 10 step plan for writing your best essay, ever! -Knowing the type of essay you are being asked to write. Persuasive (sometimes called argumentative), narrative, expository, and descriptive essays are the most popular types of essays students are asked to write, but you may also be asked to write a how-to essay. -Knowing the style you are expected to use. APA, MLA, Chicago, and Turabian are the most common writing styles you will encounter in academic writing. Although the body of the essay will be extremely similar regardless of the style, knowing the style is essential to ensuring that you are correctly citing sources in your work. -Knowing the expected length of your essay. This may seem like a given and some professors will explicitly state that they want a five-paragraph essay or that your essay should be no more than a certain number of pages. If your professor has given you those instructions, follow them. Other professors will be more difficult and tell you to write as much as you need to write to complete the assignment. A good guide is to keep your essay between five and nine paragraphs. Furthermore, while your professor might not provide direct feedback about expected length, you may be able to get him or her to look over your outline for the paper, and then be able to use that feedback to help you determine whether your paper needs to be longer or is too long. In some instances, you will be given a specific prompt and asked to respond to that prompt. Prompts might ask a question, like: Should we abolish the death penalty? Prompts may not ask a question, but instead ask you to describe something, like: Describe the role that sibling rivalry plays in Tennessee Williams’ “A Streetcar Named Desire.” When essays give specific prompts, they are usually directly related to the material or skills you are covering in a course. At other times, you will be given a broad topic, such as “write a persuasive essay.” At those times, it can be very difficult to actually pick a topic. You want to choose something that you know or want to know about; if the essay is not interesting to you, it will not be interesting to your readers. You could brainstorm to help generate some topic ideas. Your ideal topic will be something you can cover well, if not completely, in your designated space; something you want to learn or teach; and something you can present in an interesting manner. Some people will tell you to avoid certain topics because they are overdone. For example, if you are asked to write a persuasive essay, your professor has probably read countless death penalty, abortion, and gay marriage essays; it will be hard for you to seem unique or to make a new point in an essay with a well-worn topic. You could write a persuasive essay on why corn tortillas are superior to flour tortillas when making tacos, and, as long as you build a successful argument, it might be better-received than a persuasive essay on a meatier, but more common topic. However, if you are really passionate about a well-worn topic, do not let the fact that it is common keep you from writing it; just make sure you let your passion shine through in your writing. Having trouble picking a topic? We have provided thousands of essay topics to help make your task even easier. Unless you have selected a topic that you already know very well, then you are going to need to do two levels of research for your essay. The first level of research is the cursory type you need to get to know the topic; the second level of research is the research you need to actually write your paper. You are going to hear professors, writing coaches, and even other how-to-write-an-essay sites tell you to never use sources like Wikipedia when writing an essay. We’re going to tell you they are wrong. If you have been asked to write an essay about an unfamiliar topic, then sources like Wikipedia, Infoplease, and Encyclopedia Britannica are actually great places to start your research. These sites allow you to read a general overview of the topic, and a well-written article will even provide a list of citations at the bottom, which may be a great place to start the second level of your research. While you never want to rely upon a Wikipedia article as your sole source of information, and while you want to fact-check the articles because their open-source format means that people can inject incorrect information, they can be a great resource for getting a general overview of a topic. Other resources that are wonderful for providing general overviews include: History.com; Psychcentral; Plato; and Science.gov. If you are asked to write a persuasive essay about a controversial topic, you want to visit ProCon.org, a website devoted to a thorough overview of both sides of controversial issues. If you are writing about politics, it can be difficult to discern truth from spin, which makes going to a site like Politifact critical, not only in the general research phase, but throughout your project. Finally, if you don’t know about a topic, don’t shy away from using websites aimed at children to get a general understanding of the topic. The American Library Association maintains a list of websites for kids, which are then broken down into categories. While you wouldn’t use any of these websites as a reference in your completed work, they can be a great place to start in your information-gathering stage. Brainstorming is one of those words people love to use, but that is not clearly defined. The ambiguity is by design; what works for you in a brainstorming session might not work for someone else. However, by the time you have reached this stage, you have done your preliminary research and you have some ideas about your topic. Select a quiet, comfortable space without distractions and give yourself time to think about your topic, including the parameters we covered in step one. Then, write down the ideas or thoughts that come to you. Although some professors might actually require brainstorming as part of an assignment, brainstorming is for you and is a way to help you focus your thoughts on a particular assignment. One of the tricks we like to use for brainstorming goes back to the interrogatories we all learn in grade school: who, what, when, where, why, and how. When you finish your brainstorming session, you should be able to answer each of those interrogatories, know where you need to do additional research, or understand why some of those answers might not be relevant to a particular topic. The thesis statement is a one or two sentence statement that captures the entire purpose of your paper. Not only should it tell the readers what your topic is, but also what type of essay they are about to read. The greater the detail in your thesis statement, the stronger that statement usually is, though you have to be careful of introducing extraneous information that does not directly relate to the point of your essay. If you are writing an argumentative or persuasive essay, then your thesis statement should take a stand on an issue: Although many people believe that capital punishment is a deterrent to violent criminals and a means of ensuring justice for survivors, it is an essentially flawed process that should be abolished. If you are writing a descriptive essay, then your thesis statement should include the feeling you are trying to convey in your description: While I have traveled the world and been to many places, I have never found anyplace that made me feel as loved and secure as my grandmother’s kitchen. If you are writing an expository essay, then you need to let your audience know what you will be explaining, how you will be explaining it, and the order that you will use to explain it: There are three main types of artificial nails used in commercial salons throughout the United States: gel nails, acrylic nails, and silk nails. In a personal narrative, you want your audience to know what you are describing and how you will describe it: The most frightening night of my life was when I was eight years old and I woke up in the arms of a fireman, carrying me to safety past our Christmas tree, as it burned. For how-to essays, your thesis should let your audience know what you are going to teach them how to do: Making homemade crawfish etouffee may seem complicated if you have never done it before, but breaks down into three easy steps: selecting the right produce; making the roux; and cooking your seafood for the right amount of time. There was actually some disagreement among our writers. Some writers go straight to outlining after they finish brainstorming, while others go on to do the second-level of research before they do their outlines. Most writers found that they actually combined second-level research and outlining, moving back and forth between the two processes. Furthermore, many writers do not create an actual written outline, but do follow a general outline during the writing process. Therefore, we put the outline step sixth, even though we acknowledge that for some writers, maybe even you, the outline is actually going to take place in your head. An outline is basically an organizational map of the material you want to include in your essay. It can be formal or informal, brief or in-depth, and anywhere in between. Sometimes, you will be asked to turn in an outline as part of your assignment; in those instances, you are going to want to follow any specific instructions provided by your professor. In other instances, the outline you create will be solely for your own use. We start with the basic skeleton outline for a five-paragraph essay and add or delete from it, according to our needs. For an example, we will fill in the skeleton for an argumentative essay on the death penalty. I. The death penalty should be abolished because it is an ineffective penalty that does not accomplish modern criminal justice goals. II. The primary reason that the death penalty should be abolished is because it is an irreversible penalty and the potential for error remains unacceptably high. III. Because the potential for error is so high, the death penalty comes with an automatic review process that makes it a prohibitively expensive sentence when compared to life imprisonment. IV. Although often touted as a deterrent for murder, the death penalty is not correlated with lower murder rates. V. While the death penalty may seem like the most appropriate punishment for someone who has callously taken the life of another, an objective overview demonstrates that it has no place in modern society. Once you have finished your outline, you are going to discover that you have made some points that you need to back up with actual facts and figures from a reliable resource. Using the capital murder outline above, if you want to support the fact that the death penalty is more expensive than life imprisonment, then you are going to need reliable figures about those costs from a source that is considered academically valid. You will hear people talk about scholarly sources, which are a great place to start. Scholarly sources are usually going to be found in scholarly journals, will probably be peer reviewed, and are written by subject-area experts. However, not all projects require scholarly research; in fact, if you are writing about a current event, you will not be able to find scholarly articles about that event because of the length of time inherent in the peer review process. Therefore, you need to know what types of non-scholarly resources are considered reliable and valid academically acceptable sources. This is where you avoid sources like Wikipedia. Instead, you want to focus on academic websites, well-established publications like newspapers or magazines, .gov or .org websites, primary source documents, and books. However, you have to use any source with caution; the proliferation of the internet has made it possible for just about anyone to publish just about anything. If the source you are using draws dramatically different conclusions from other resources in the field, then you might want to research that source before using it. Some people or groups publish simply to push an agenda. In fact, there are even a few “peer reviewed” journals in different disciplines that have been created to push an agenda and they focus on controversial areas like climate change and homosexuality. If a journal only or primarily publishes articles that support an agenda or conclusion which is not supported by the majority of scholars in that field, you can use the articles in that journal, but you should disclose to the reader that they are in conflict with the majority of other scholars in the field. How do you find your resources? As a student, you probably have access to a bunch of paid search engines like BASE, ERIC, and Lexis-Nexis that you can use to find scholarly journals through your school, and your school’s librarian is a great resource for helping determine which of those search-engines is best suited for your research. Your professor may even specifically direct you to only use sources available through your school’s library or through a specific academic search engine; in that case, follow those instructions. However, there are also literally hundreds of free research tools you can use to help you find research. You probably already know about Google Scholar, but our other free favorites include: PubMed, and FindLaw. Need a more specific niche? The folks at online universities have created a list of 100 time-saving search engines for serious scholars, which, as its name suggests, lists 100 of the top academic search engines. A. Eyewitnesses are unreliable- it is not enough to say that eyewitnesses are unreliable; here you need to provide some type of resource discussing the unreliability of eyewitnesses. Look for psychological research into eyewitnesses or legal documents where eyewitnesses have been proven wrong. You do not need to find an actual percentage here, simply to establish that eyewitness testimony is not fool-proof and is, therefore, unreliable. B. DNA in actual innocence cases- for this statement, you want to prove that DNA has exonerated many defendants- having figures would be great, but you could also list three or four people who were convicted and later exonerated because of DNA evidence. C. Evidence falsification- you won’t be able to find figures on falsification, but you should be able to provide examples of cases where someone in the criminal justice system has falsified evidence in order to make a conviction more likely. A. Cost of the death penalty- you want to find figures on the average cost of putting someone to death. B. Cost of life imprisonment- you want to find figures on the average cost of life in prison. C. Non-review costs of the death penalty- you may or may not need a source on this information; you could detail the actual financial costs, which would require citation, or simply name contributing factors to higher costs, such as maintaining a death chamber and the cost of keeping death row inmates separate from general population. A. Most murders are spontaneous- this is a controversial statement, so you are going to want to find some evidence to back it up, like a research article interviewing a number of murderers and asking them to describe the circumstances of their crime. B. Murder rates in death penalty states- a specific figure, so you will want a source. C. Murder rates in non-death penalty states- a specific figure, so you will want a source. Once we have looked at the outline to see where we need citations, we can either turn to our research for that information or do further research to get the information that we need. For example, looking at the outline, we see that we need a citation for the cost of the death penalty, so we Google “cost of the death penalty.” The first few results in our search all yield the same site, which is a .org, so we visit it and discover it is a site established with the goal of abolishing the death penalty. Because the site has an agenda other than the transmission of information, we immediately become wary of using it as an academic resource because of the possibility of bias. However, we see that Forbes and NBC both have articles addressing the relative cost. Therefore, we skim those articles to see if they have the facts or figures that we need. They do, but if they did not, we could go back to the website with an agenda and see where it got its facts and figures. In this case, it cited an academic study, which we could then find, read, and use for the source in our paper. 1. The reliability of eyewitnesses can be impacted by a number of factors, including: the nature of the event, when and where testimony occurs, the personality of the witness, and whether a lineup was used in identification. The result is that, even a witness who seems certain about his or her testimony, may simply be wrong (Wells and Olsen, 2003). 2. Wells, G. & Olsen, E. (2003). Eyewitness testimony. Annual Review of Psychology, 54, 277-295. The new notes in the outline use the phrase that we intend to use in the paper to help bolster the claim that eyewitnesses are unreliable, along with proper APA citation to that source. To make things easier when writing the paper, we included the source as it should look in our reference page, so that we do not have to go hunting through our notes and reference materials to find out what source we meant; we simply cut and paste it into our Reference page. If we were using a citation style like MLA, which requires page numbers in a citation, then we would have included that information, as well. Once we have addressed every area of our outline where we see that we need a citation or reference to a fact or figure that is not common knowledge and found that research, then we are ready to sit down and write the actual paper, a process that will take a surprisingly short amount of time if all of the background research and preparation is finished before we start writing. Whether or not to abolish the death penalty has been a controversial issue in the United States for several generations; although it was practically abolished in the 1970s, states changed their rules and the death penalty made a steady come-back throughout the United States. Many discussions of the death penalty focus on whether it is a moral or ethical punishment. However, determining whether the death penalty should be abolished does not require a moral or ethical debate; one need only look at the incontrovertible facts to determine whether or not the death penalty should continue. There is a potential for error in the conviction process, which means that an innocent person could receive the only punishment that is irreversible: death. Second, the death penalty is prohibitively expensive, so that it costs far more to execute a prisoner than it does to incarcerate one for a lifetime. Finally, the death penalty is not a deterrent to murder; murder rates in areas with the death penalty are significantly higher than in areas without the death penalty. Therefore, the death penalty should be abolished because it is an ineffective penalty that does not accomplish modern criminal justice goals like certainty, cost effectiveness, and crime prevention. You simply use the same fleshing-out model to complete the rest of your essay, working with each individual paragraph until you have completed your paper. You may then choose to add to your paper, giving more in-depth explanations of certain positions or adding language to help transition between paragraphs. -Write in the third person, avoiding the use of “you,” “I,” or “we” unless the format of your essay specifically calls for their usage. For example, you can use “I” or “we” in a personal narrative, and, in some cases, you may be permitted to use “you” in technical how-to writing. -Keep a consistent tense throughout the essay; usually, you will want to write in present tense. You can make some exceptions to this rule, such as when you are using a historical fact to bolster your argument. However, the general tense of your essay should remain consistent. -Make your writing active and exciting. It is common for professors to tell you to avoid “be” verbs, which is helpful, but not always practical. There are sometimes when a “be” verb is the best verb to use in a sentence. However, if there is a more exciting and active way to say the same thing, choosing it over the be verb will greatly enhance your writing. “The dog was sad,” does tell the reader about the dog’s mood. However, “the sad dog sighed heavily as it made circles in its bed, wondering when its owner would return,” does a much better job of capturing how the dog feels. -Make sure you have enough text and sources in the paper to satisfy the assignment. If you do not you will need to go back and add more quality information and sources to make your essay longer. Remember that points will be deducted if you do not satisfy the word count specified. -Make sure that every source you cite in the body of the paper is included in your works cited/ references/ bibliography page. For some of the essays you complete, you may even be required to include an annotated bibliography, which summarizes each source used in the paper. For more information on how to correctly cite sources and format your works cited page, please see our citation guides for the appropriate style. -Have someone proofread your work. Our professional proofreading and editing services are extremely affordable, even for college students on a budget. However, if you cannot afford professional proofreading or editing, then seek out a friend, a mentor, a professor, or a teaching assistant who will read over your paper and make suggestions for improvement. Now that you have read this guide on how to write an essay, we hope that you have a better understanding of the fundamentals required for completing this type of assignment. If you follow the 10-steps we provided, you will be well on your way to earning better grades. Although this maybe a lot of information to digest, we provided you with as much detail as possible to make this process as simple and stress-free as possible. If you have any additional question while writing your essay, post them below and we will try our best to point you in the right direction. If you still need help writing an essay or want a one-of-a-kind example on your topic to use as a guideline, place an order with our custom writing service. Have any tips for other students to help them write better essays? Leave them in our comments below. "How to Write an Essay." Aceyourpaper.com. Student Network Resources Inc, 4 April. 2017. Web. 19 April 2019. Student Network Resources Inc. "How to Write an Essay." Aceyourpaper.com. https://www.aceyourpaper.com/essay-writing/how-to-write-an-essay/ (accessed April 19, 2019).